Gina (Terrasi) Gallagher and Patricia (Terrasi) are sisters who share a love of wine, humor, and writing (excluding checkwriting). They are also among the growing number of parents raising children with disabilities. Inspired by the success of their sisterly heroines, Mary Kate and Ashley, and fed up with listening to parents brag about their “perfect children”Â and never asking about theirs, the sisters decided to seek therapy by writing a book. So in 2006, they self-published their first book, Shut Up About Your Perfect Kid! The Movement of Imperfection, which explores the humorous, heartwarming side of raising an imperfect child in a world pre-occupied with perfection. 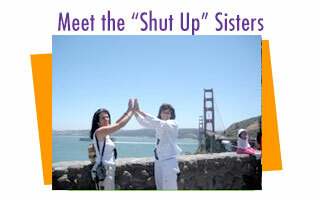 Find out more about the “Shut Up Sisters” by clicking here. where is the conference and when is it? There are no details given at all! How much is the conference? Details, please!